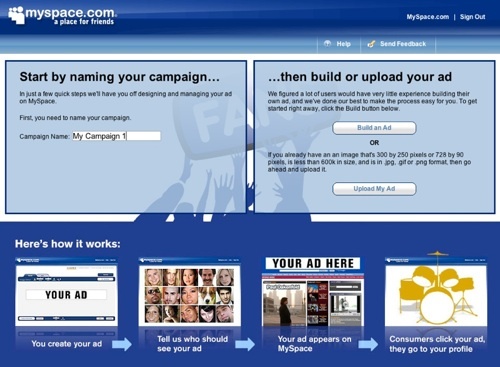 Last week I posted a full review of the new MySpace advertising network. After using it for about a week and really getting a feel for it, I’ve come across some cons. Firstly, getting an ad approved takes days it seems. At the beginning (I signed up on the first day), my ad was approved in a couple of hours. However, because of the surge of traffic that MySpace is now getting from advertisers, it’s slowed down the entire process. I placed a new ad on Monday and only got it approved earlier today — almost three days later. From the ads I have got approved, they don’t seem to be converting as well as they did at the beginning. Again, coming back to the traffic surge issue — too many advertisers placing too many ads at once makes the consumer feel overwhelmed with advertising all over the place. There also needs to be more category options to sort and target your ad. If I’m running an ad based on getting out of credit card debt, there is no option to select “Debt” as someone’s favourite past time shown in their profile. And I doubt anyone would put they enjoy being in debt anyway. It would be great if there was a keyword tool that you could also use in conjunction with the categories, but for now you’ll have to make do with what MySpace offers. By talking to a few other Internet marketers, I feel lucky by getting my ad approved in only 3 days. Some are still waiting over 5 days to get an ad stamped with the seal of approval. I’m sure these little bumps will get smoothed out as the network progresses, but for now, I think I’ll stick to Facebook Ads and Google AdWords. First off I want to compliment you for providing useful information with Money Making Scoop. I truly enjoy receiving it. Regarding advertising in any form, what is the best free way to kick a project off? This is probably a standard question but given the state of my pocket book I am obligated to experiment before I invest. Personally, I view internet advertising as being compared to a slot machine and I’m not very lucky with slot machines either. The best free way to get some advertising is to create your own blog/site and join groups on Facebook which are based on the same topic. Get to talking with people and share your knowledge about a subject you know a lot about. Or post your link in the signature of a forum you frequent (but don’t spam). Participate actively in the discussions and become an authority on a topic. The traffic will then come pouring in. Also, try to be controversial sometimes in your writing and create a shock factor that may end up being Stumbled or Dugg by some of your readers. There are endless possibilities without having to spend any money. Thank you very much for the reply and regarding the reply allow me to quote “create a shock factor” from it. Frankly, you did that with me as a result of the immediate response to my question. P.S. I have subscribed to 10 Killer Ways To Multiply Your Sales. Chris, forgive me for taking advantage of your time but if I may, I would like to receive your opinion of 1stPromtionPro2. I’m striggliong with trying to find a program of any kind that I can be comfortable with and stick with. Obviously, I’m new at this sort of thing and a little overwhelmed with offers and information. However, 1stPromotionPro2 seems like a very good opportunity and I’ve tried to find something wrong with it online but I can’t. The company is in your neighborhood and considering that you may know the fellas involved your opinion and/or advice will be most helpful. Personally, I have no experience with 1stPromtionPro2, nor have I read much about it. From what I do know is that it’s run by Mike Filsaime, who is a seasoned guru Internet marketer and usually comes out with worthwhile material. Thank you for the reply Chris. Mike Filsaime has a good reputation and 1stPromotionPro2 is attractive. I may go for it.